Most readers know Mary as Percy Shelley’s wife and the author of Frankenstein, but many critics feel her writing deserves more attention. 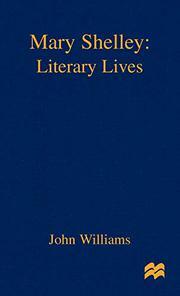 British scholar Williams (Romantic Poetry and Revolutionary Politics, 1989) aims to tell her story and evaluate her position in the 19th-century literary canon. Mary was the daughter of radical William Godwin and pioneering feminist Mary Wollstonecraft (who died giving birth to her in 1797). Godwin proved a poor father, neglecting the child who worshipped him and later on marrying a woman she grew to detest. His home teemed with intellectual activity, however, and Mary grew up surrounded by London’s literary elite. Despite her sophistication, Mary was capable of losing her head, and the arrival in 1814 of the notorious atheist and radical Percy Shelley (not yet known as a poet) bowled the girl over entirely. She and her half-sister Claire Clairmont ran off to France with him, Shelley’s abandoned wife killed herself shortly after their return, and within three weeks Percy and Mary were married. This caused a scandal, and soon the three were back in Europe. There followed six years of what can only be called a hippie existence minus birth control (but with better writing). The Shelleys plus Byron and other friends traveled, schemed to improve the lot of man, and wrote great literature. The women bore children almost continually. The adventure ended when Shelley drowned, the friends dispersed, and Mary returned to England. She spent the next 30 years writing and working to build the reputation of her husband. Although Mary Shelley’s life was fascinating, this is not the place to learn about it. The author states clearly that he is writing a literary life, and his narrative pauses frequently for a discussion of how Mary transformed a particular episode into fiction. There are extensive summaries of her work, along with speculations as to how each reflects the era, the various literary genres, or Mary’s personal crises. Although this works as literary criticism, readers purely interested in biography should look elsewhere.